Mallojula Koteswara Rao (real name of Kishenji) born in a poor family in Andhra Pradesh to Gandhibaadi Freedom Fighter family and later became the leader of Maoist Activities in various parts of India. But, the life of Maoist Leader Kishenji ended in November 2011 when Central Military Force shot him dead in Burishole Forest Range in Midnapore District of West Bengal. Let’s check out the Family, educational life details of Kishenji below. • Real / Original Name of Maoist Leader Kishenji: Mallojula Koteswara Rao. • Nickname of Maoist Leader Kishenji: Prahlad. But, during various Maoist projects Kishenji took various names like Murli, Ramji, Surya, Jayanta, Sridhar etc. • Age of Maoist Leader Kishenji: Maoist Leader Kishenji died when he was only 55-years old. • Hometown / Ancestral House Address of Maoist Leader Kishenji: Peddapalli Shibalayam Street, Karimnagar, Andhra Pradesh, India. • Family Background of Maoist Leader Kishenji: The father name of Maoists Kishenji is Mallojula Venkataiyan (his father was a Gandhi Ji followers & freedom fighter), mother name of Kishenji is Mallojulla Madhuramma, and Wife name of Maoist Leader Kishenji is Mainakka (aka, Kalpana and Sujata). Kishenji’s wife is also an active member of Dandkaranya Special Maoist Zonal Committee. One of the brother of Maoist Leader Kishenji works in a Bank and another brother of Maoist Leader Kishenji is the Politebureau Member whose name is Mallojula Venugopal Rao (aka, Vivek, Bhupathi & Sonu). Maoist Leader Kishenji and his wife Sujata have two children; one Daughter & one Son and they both are college students (as on 2011). • Educational Life & Qualification of Maoist Leader Kishenji: Kishenji was a meritorious student during his school & college life. Maoist Leader Kishenji completed his Bachelor Degree in Mathematics from Jammikuntar Adarsh College of Karimnagar in 1973, and then L.LB from Hyderabad. Maoist Leader Kishenji had vast knowledge in various regional languages like Telegu, Bengali, Oriya and also knew English & Hindi. • Life of Maoist Leader Kishenji: Maoist Leader Kishenji first joined the activities of separate Telengana State Demand in South India during 1974-75 and then joined Peoples War Group (PWG). Later on, with the years passing by, Kishenji able to establish a strong Group and extended his reach as well from South India to other parts of India. Kishenji leaded Central Committee, Central Military Commission etc during his professional maoist life. It needs not to say that Maoist Leader Kishenji was the spearhead of Maoist Attacks & Groups in West Bengal, Bihar, Jharkhand & Orissa region since 2002. Maoist Leader Kishenji had so many times formed Maoist Attacks in Bengal like in 2005 at Nandigram, 2007 at Bihar-Jharkhand Border Jungle area, etc. Andhra Pradesh State Government had announced the highest amount on Kishenji, i.e. Rs.20 Lakh but none able to arrest Kishenji alive. Maoist Leader Kishenji always had special trained PLGA Members (Peoples Liberation Gorilla Army) whenever Kishenji planned to attack or in any Maoist project. 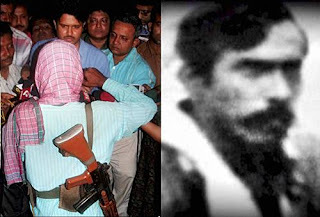 AK-47, Insus, 56-Assault Rifle & many other advanced weapons are used by Maoist Leader Kishenji. • Hobbies of Maoist Leader Kishenji: During his leisure time, Kishenji used to read Newspaper, listen to 70’s Hindi Film Songs on his Computer and surfed Internet. • Death of Maoist Leader Kishenji: At last on 24th November 2011 (Thursday) at Burisole Jungle of Medinipur (Paschimbanga), Maoist Leader Kishenji shot dead by Central Army Force. Search Tags: Maoist leader Kishenji Birthday Address Mobile Phone Contact Number Maoist leader Kishenji Family Father Mother Wife friend Children Son Daughter Maoist leader Kishenji Qualification Educations School College Name Maoist leader Kishenji professional Career Achievements Maoist leader Kishenji Early Personal Secret Professional Educational Life Maoist leader Kishenji latest news Details, Maoist leader Kishenji profile biodata biography details Maoist leader Kishenji birthday address mobile phone contact number Maoist leader Kishenji family father mother wife husband son daughter children names Maoist leader Kishenji education qualification Maoist leader Kishenji works career occupation Maoist leader Kishenji personal professional educational life background Maoist leader Kishenji latest news updates information.